Somalia’s National Security Advisor Abdisaid Ali talks about political will, security reforms in Somalia’s Transition Plan, and the commitment to domestic and international coalition building to sustain the country’s progress. Somalia’s state-building efforts, including initiatives to strengthen security and rebuild the political system, have proceeded steadily since the inauguration of President Mohammed Abdullahi Farmajo in February 2017. Nonetheless, serious challenges remain. The Africa Center for Strategic Studies spoke with Abdisaid Ali, National Security Advisor to the President of the Federal Government of Somalia, to take stock of the progress. For the last 10 years, security in Somalia has not been delivered by the state. We owe a debt of gratitude to the African Union Mission in Somalia (AMISOM) whose forces from Ethiopia, Kenya, Uganda, Djibouti, and Burundi have been the primary security providers since their deployment in 2007 and whose presence and sacrifice has enabled the progress to date in Somalia. Other international partners have also made significant contributions, notably the United States and other bilateral partners who have provided the security forces and equipment that have enabled the re-establishment of federal and state government after the overthrow of the Union of Islamic Courts. The violent extremist Islamist group al Shabaab has been and continues to be the greatest security threat in Somalia and the region. The group retains a determination to control parts of the country, impose their radical ideology on Somalis, and target the Somali government and security forces. 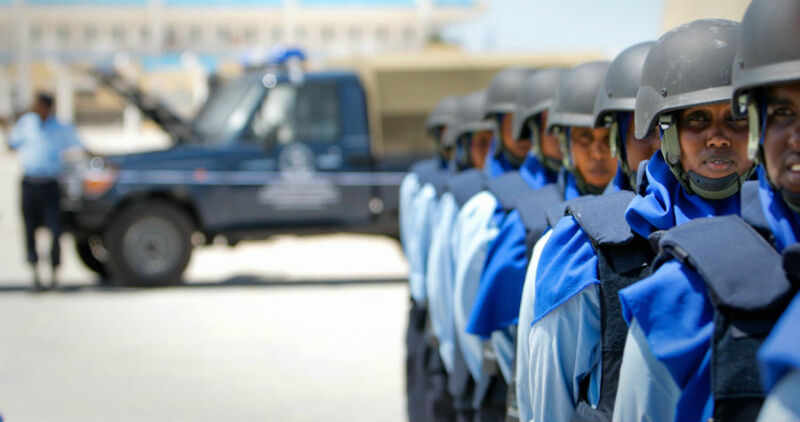 The security institutions and forces in Somalia are at an early stage of development and yet are faced with a threat that would be daunting for most established security forces. After years of misplaced investment, disjointed attempts at reform, and a lack of a common vision for security in Somalia, an Operational Readiness Assessment of the Somali National Army in 2017, led by the federal government, highlighted the need for significant reform and a more systematic approach to building and sustaining the army. One of President Farmajo’s first acts after taking office in February 2017 was to agree to a National Security Architecture. This historic agreement was the basis of the Security Pact signed between Somalia and international partners at the London Somalia Conference in May 2017 that laid the foundations for the building of an able, accountable, affordable, and acceptable security sector. The Architecture sets out the composition, structure, and scope of the security sector in Somalia, the size of the security forces, the roles of the institutions for civilian oversight, and the division of command and control between the federal government and the Federal Member States (FMS). It marked the first time that Somalia had formalized and agreed to a vision for its security institutions. In December 2017, the federal government, working closely with the FMS, AMISOM, troop contributing countries, and international partners, committed to develop a plan which would enable Somalia to gradually assume responsibility for security. 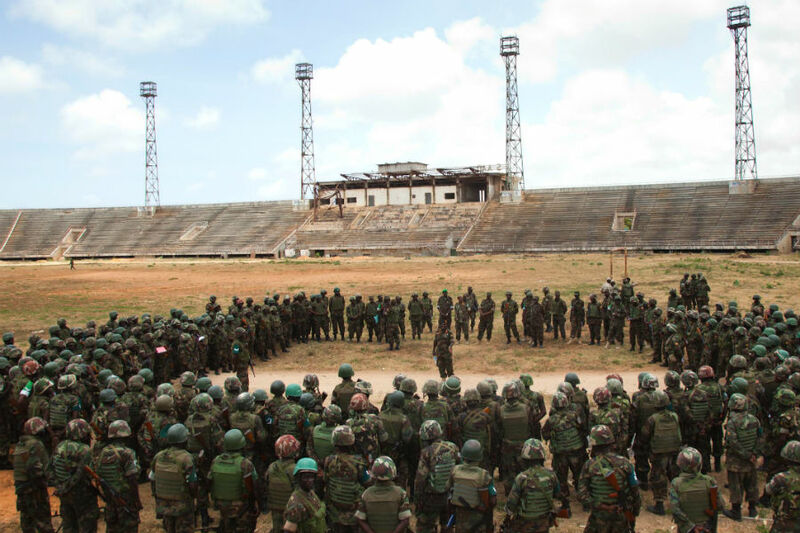 The plan includes the gradual transfer of responsibilities from AMISOM to Somali forces. It also covers those parts of the country where AMISOM has never had a presence but where security institutions and capacity need to be built. The planning horizon is the next four years, up to the 2020/2021 elections, though it is recognized that rebuilding the Somalia security sector will be a long-term process. Transition is ultimately about Somali state-building and peace-building, with the emergence of effective Somali institutions. This plan is different to previous strategies on security because it takes a broad view of what contributes to security. We recognize that military operations alone will not sustain the transition process or build a lasting peace. Our emphasis on aspects of security such as rule of law, local governance, and youth employment represent a new way of approaching security in Somalia. The Transition Plan also draws lessons from the obstacles of previous strategies for security in Somalia. Ensuring that civilian-led approaches including stabilization are embedded in operational plans and are sequenced with uniformed operations is one significant change. Other differences include an emphasis on local consultation and engagement in the planning and implementation of transition, as well as the need to address the political questions which will underpin the security institutions. These include the composition of the security forces, the allocation of security resources between the federal government and FMS, and the command relationships within the security institutions. The National Security Council has become a regular feature in the pattern of engagement between the federal government and FMS. Chaired by the president and comprising the leaders of the FMS, the National Security Council has been and will continue to be the vehicle for political decisions related to security, and which are then referred to Parliament for review. Decisions to date have related to the assessment and policy for the integration of regional forces, as well as the role and support for regional security offices. These key political decisions provide the framework for technical implementation. Corruption and old allegiances run deep and changing the mindset to ensure that ordinary Somalis benefit from security is a significant challenge. Despite this, there is a new generation of politicians emerging who are working to overturn the old ways in order to increase transparency, and bring genuine change to Somalia. These Somali-led factors combine with a desire among our international partners to see a return on their investment in security in Somalia. The troop contributors to AMISOM have said they wish to see an exit strategy for the force, and our other international partners have made significant contributions that cannot be open ended. We are now ready to progressively assume responsibility. Through the Transition Plan we have the combined political will of Somalia and its international partners to see the plan succeed. A Ugandan AMISOM police officer on patrol. The Transition Plan represents a significant change in the planning and delivery of security in Somalia. 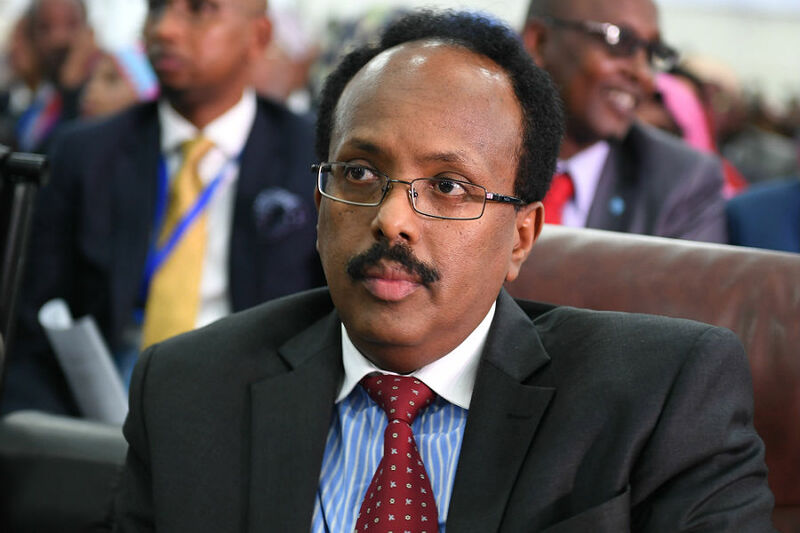 It is not “business as usual.ʺ Under President Farmajo, Somalia is ready to begin to assume responsibility for security in a sustainable, gradual, and coordinated manner. The federal government’s strategy is to construct and implement a comprehensive approach to security transition that is not only based on the military, but equally focused on progress on the political roadmap, constitutional reform, stabilization, local governance, politics, and state-building activities that include institutional expansion of local policing and justice. Legitimate governance and inclusive politics is the basis for all the other reforms and capacity building we are doing across the government and across the country. Without meaningful political representation and access to justice, we cannot build trust in Somalia’s security institutions or provide the basic services necessary to counter the shadow administrations of al Shabaab. Constitutional reform will be critical in formalizing the allocations of responsibilities, including for security, between the institutions at a federal level, and between the federal and regional levels of government. In parallel, we will continue our economic reforms in order to generate the revenue and institutional accountability to enable the regular payment of salaries and sustainment. Operational activities: The identification and prioritization of locations to be under full Somali security force responsibility, including the handover of locations from AMISOM, and the deployment of forces agreed to in the National Security Architecture. This will mean that towns, key roads, and national infrastructure can be transferred progressively to Somali security ownership, enabling Somali security forces to lead operations and for AMISOM to scale back its presence. Institutional capacity building: Implementation of institutional capacity-building programs and plans including implementation of the National Security Architecture, recommendations from the Operational Readiness Assessment, policing, justice, and civil service reform. This includes payroll reform, policy and doctrine development, civil service restructuring, force generation, training, and the passage of key legislation. Supporting activities: Aligning non-security force efforts to create the conditions for a sustainable peace, including stabilization, strengthening local governance, reconciliation, mediation, the rule of law, socioeconomic activities, and preventing/countering violent extremism activities. Activities will be well consulted with local communities in order to meet their needs but could include road rehabilitation, the provision of health or education services, district council formation, and job creation. As part of the Institutional Capacity Building activities of the Transition Plan, we have also begun key reforms in order to implement the National Security Architecture and set Somalia on a path to achieve an affordable, acceptable, accountable and able security sector. These include biometrically registering Somali National Army (SNA) personnel in order to institute payroll reform, reducing the number of SNA departments from 23 to 13, and reassigning a number of generals who were not effective and replaced them with better qualified, younger officers from lower ranks. Since December 2017, we have been developing a comprehensive plan that sets the strategic direction for the transition process and identified some initial areas in which to target the technical planning. It is a very different way of working compared to previous engagement on Somalia. This represents a new mindset, not only that the priorities and decision-making are Somali-led, but also a new comprehensive way of approaching security. The inclusive nature of the process is also an important component of the transition planning. The federal government developed the plan with the FMS and set the national priorities in consultation with them. We have also worked closely with AMISOM, the troop-contributing countries, and international partners and will continue to do so as we move into the implementation phase. Somalia has benefitted from the generous support of donors for many years. However, projects have often been distributed unevenly across the country and not anchored in a wider Somali-led strategy. This is now changing as we are calling for donors to align their existing activities to the priorities set out in the Transition Plan in order to have a multiplying effect from their contributions. The active coordination and joint planning by Somali and international stakeholders demonstrates the clear political will of Somalia and its partners to deliver against ambitious timelines. What factors will determine the success or failure of the transition process, what are the obstacles to progress, what could slow or derail the process, and what issues need to be overcome? The unity and political will of all stakeholders will be essential to the success of the transition plan. The federal government, the FMS, AMISOM, troop-contributing countries and international partners will all have to remain engaged and committed to delivering the plan. As we move into implementation there will be many challenges, both of security, resources, institutional capacity and political divisions. There will be some who seek to undermine our work, those who have benefitted from the status quo or who do not wish to see a peaceful, stable and united Somalia. But if all the stakeholders are committed to the vision set out in the transition plan, we can overcome these factors. We should also be aware that to be realistic, transition will take many years to achieve in full. We are working hard to maintain the momentum of activity but many of the essential components underpinning the location-specific activity are long term initiatives. Some will take generations to embed and progress will not be linear. We should not rush it for the sake of donor deadlines, but we must keep up a steady pace of activity. While transition will take many years, this horizon enables detailed planning to take place in a realistic time frame and enables us to monitor progress and adjust the plan as necessary. In addition to beginning implementation in the priority locations set out in the plan, Phase 1 lays the foundation for longer term capacity building over the next few years. Among other tasks, this includes enhanced support for the Regional Security Councils, a rewriting of the Somali Military Discipline Code, the resectorization of the Somali National Army to align with the FMS boundaries, and strengthened community policing services in selected population centers. One of the initial priority locations is the Mogadishu Stadium. The stadium is the biggest sporting facility in Mogadishu and was constructed in 1978. Most recently it has been used by national and international security forces as an operating base. The intention of the federal government is to restore the stadium and to use it for national and international football tournaments as this would carry enormous symbolic importance for the entire Somalia population while strengthening national unity. For the federal government, as well as the Banadir Regional Administration, the re-opening of the stadium would provide a source of entertainment to the youth and generate revenue through organizing football matches. The people of Mogadishu, especially the youth community, are keen to see the stadium reopened in order watch and play football, a popular pastime in Mogadishu. The business community also has an interest of the return of sports tournaments to the stadium, which would include significant commercial activities. We plan to hold a football tournament in the stadium by the end of 2018. Ultimately, success is for Somalia to assume responsibility for security. However, security is not an end in itself. By providing security, we hope to see the return of normalcy for the people of Somalia with freedom to move around without the threat of al Shabaab, open businesses, play sports, go to school, and engage in politics under the protection of the rule of law and protection for their human rights. This will require the legal and administrative frameworks to be in place, including through processes such as the Constitutional Review Process, a functioning judicial system and the establishment of a Constitutional Court. These are long-term national-level endeavors. In the meantime, there can be significant progress at local level to bring communities together to resolve disputes, promote reconciliation, and dissolve some of the underlying causes of conflict. Efforts at all levels, from local communities to the highest institutions in the country, will be necessary to rebuild the country and enable the security sector to play its part in protecting the lives of Somali citizens. Therefore, our vision of normalcy also includes appropriate security forces, such as community police, as the primary security provider and the gradual de-militarization of the country. These goals will not be achieved overnight, but along the way there are indicators of success we are looking for. These include the handover of key national institutions such as the stadium, the opening of main supply routes, the passing of key legislation to reform our security institutions, the reconfiguration of AMISOM from military to police support for our security forces, and implementation of community-based projects to improve the lives of the Somali people. As we make progress with this ambitious project, our aim is for the benefits to be felt by the population of Somalia, and for their security to be provided by the Somali state. Africa Center for Strategic Studies, “Taking Stock of Somalia’s Security Landscape,” Panel discussion with Abdisaid Ali, October 17, 2018. Africa Center for Strategic Studies, “Militant Islamist Groups in Africa Show Resilience over the Last Decade,” Spotlight, June 28, 2018. Africa Center for Strategic Studies, “AMISOM’s Hard-Earned Lessons in Somalia,” Interview, May 30, 2018. Ken Menkhaus, “Non-State Security Providers and Political Formation in Somalia,” Center for Security Governance, April 1, 2016.